This one was tough. Like most of you I assume, I’ve taken this one pretty hard. It’s been harder going back through and rewatching it. If you would have told me that Oklahoma would have a 31-14 lead with six seconds left in the first half, I would have taken it ecstatically. 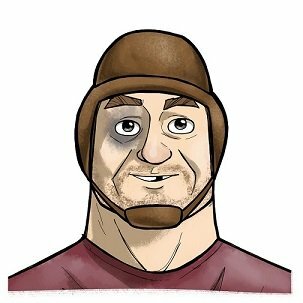 After all of the film I watched on Georgia, leading up to the Rose Bowl, I knew they were good, but offensively they’re not as good as what our defense made them look. 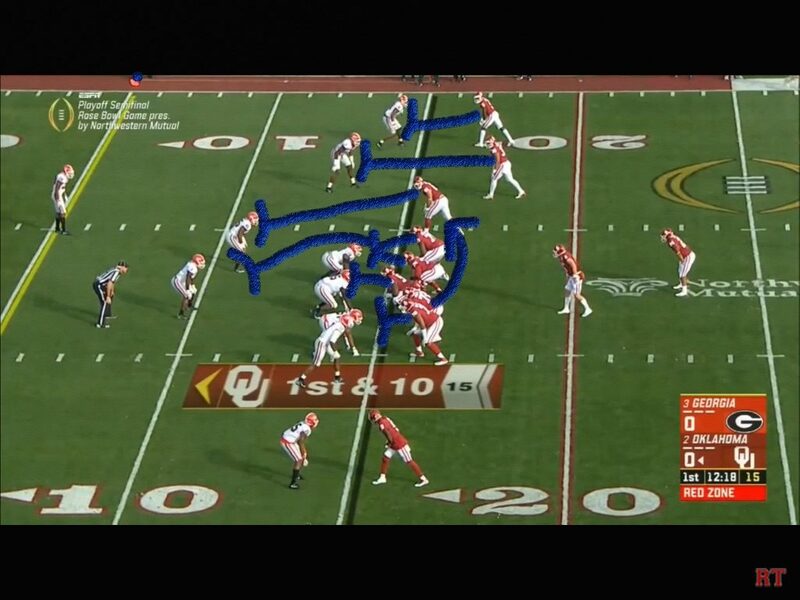 Being as nice as I can about it, this was the most ill-prepared I’ve seen a Sooner defense look. 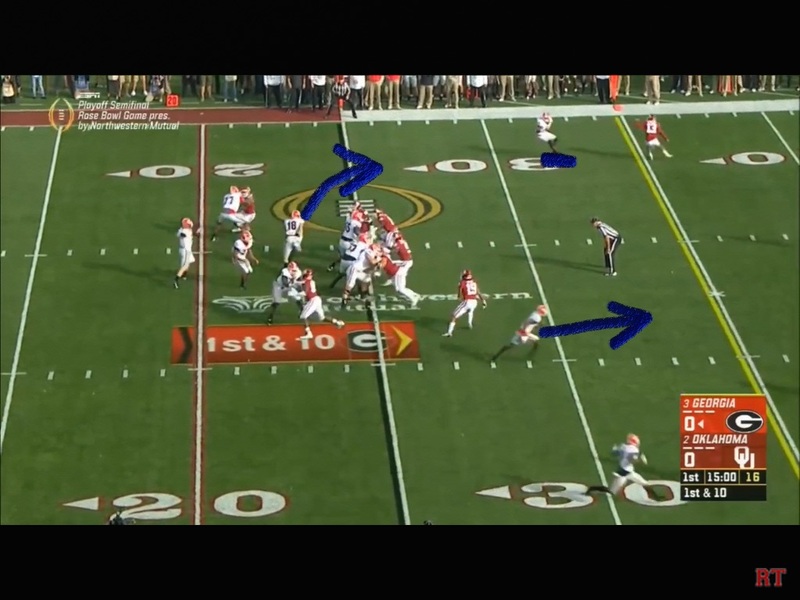 With almost a month to prepare for this Georgia matchup, I could see the Sooners doing a lot of things defensively that would have made it tough on this Bulldog offense. This unfortunately wasn’t one of the things I was hoping for. Both of the corners are 7 yards off. Against a young qb in a huge spot, I was hoping that the corners would be up in their face playing aggressive. 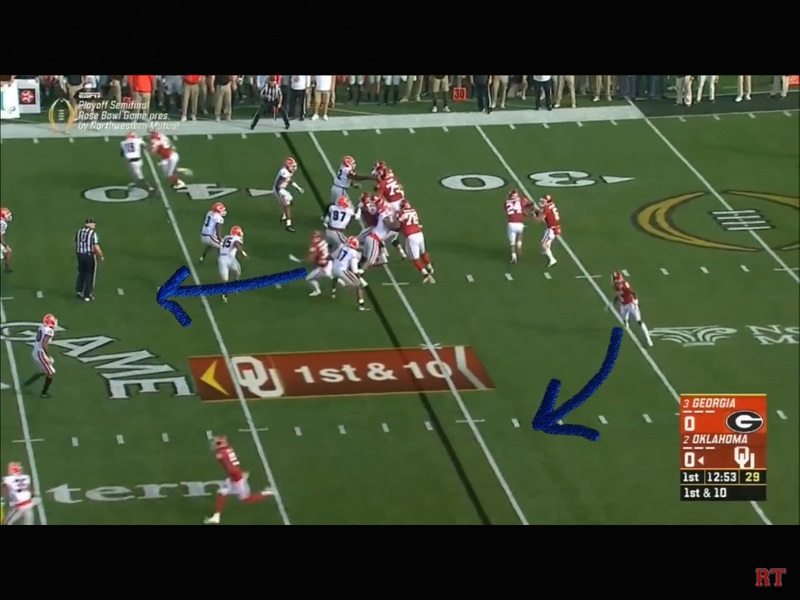 The Sooners did come out in more of a 4-3 look with a 5-3-A-5 alignment. The problem with playing so far off, is that when the receiver turns on a stop route, you’re three yards away. It’s easy money, and if you miss the tackle, like Norwood did, it’s a confidence builder. 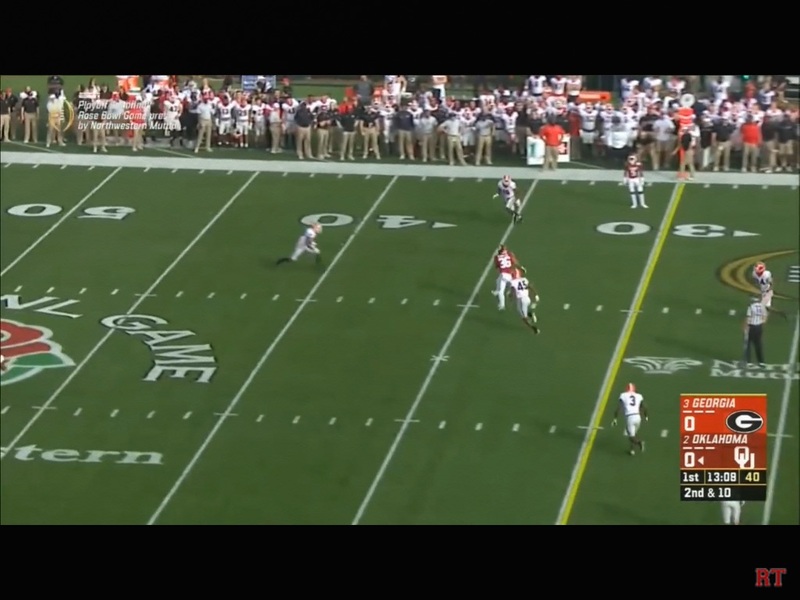 Fromm had his pick of receivers here, and early with the quick throws, it appeared that Georgia feared the Sooner pass rush a bit. After that, it was an automatic call again, but this time Norwood broke it up. Wims dropped it after it was contested a bit, and early, it looked like Georgia was nervous. On the 1st run play, Steven Parker came free and made a good play for a short gain. 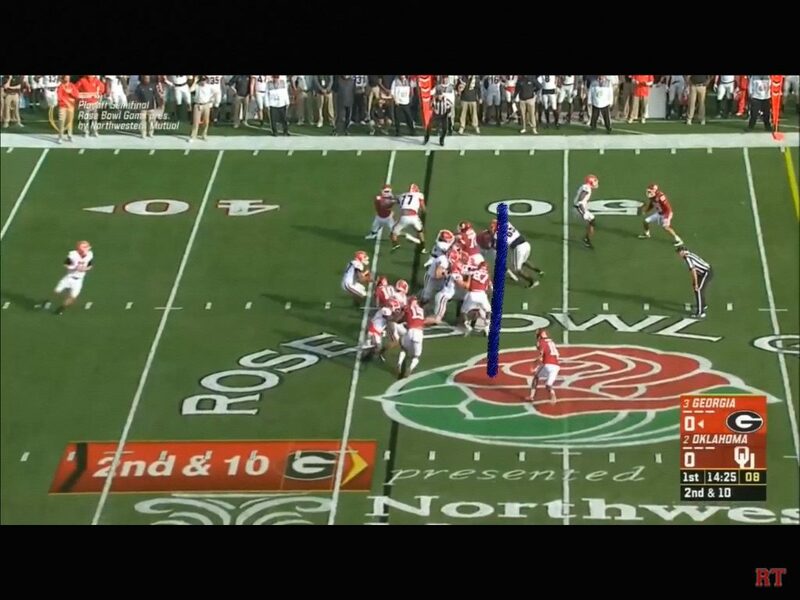 Normally it’s hard to get movement on the 1st series against a defense, but Georgia’s offensive line knocked the guys two yards off the ball. 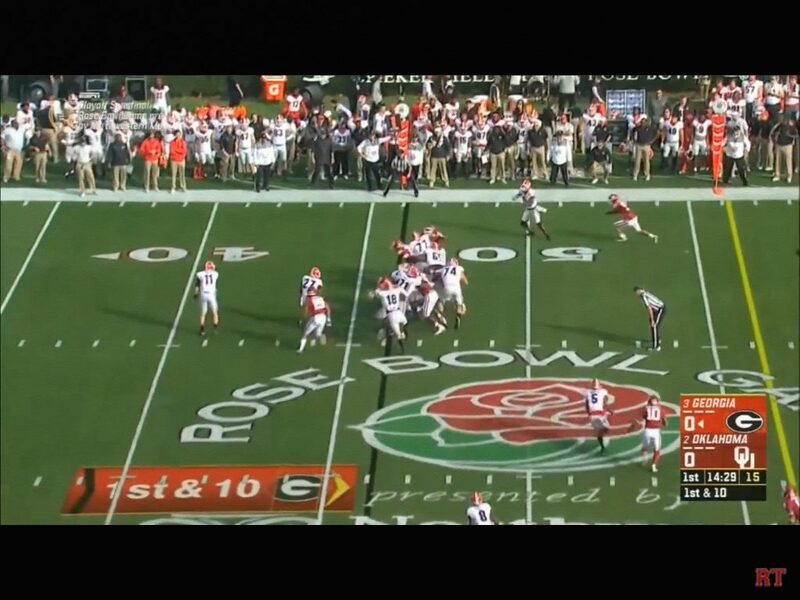 And along the lines of Fromm and Georgia in general being nervous, there’s nobody within the screen shot covering the receiver. 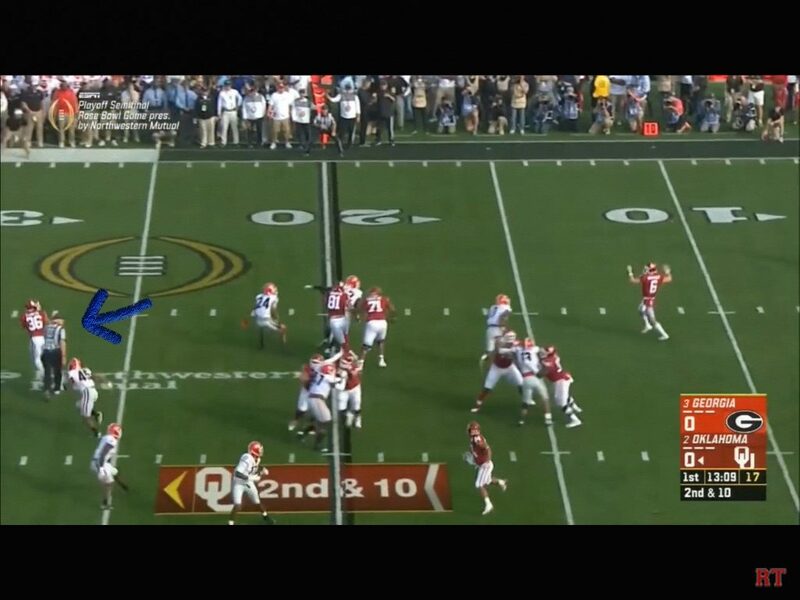 Fromm got the slightest bit of pressure and had a bad throw. I was thinking early, somebody has to see that and crank up the heat. 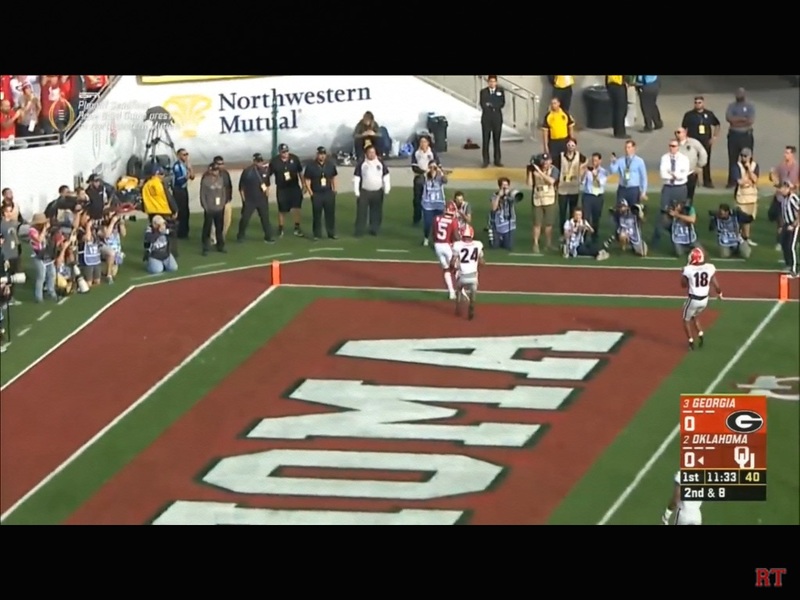 After the Sooners forced the punt, they ran the ball on the 1st play. 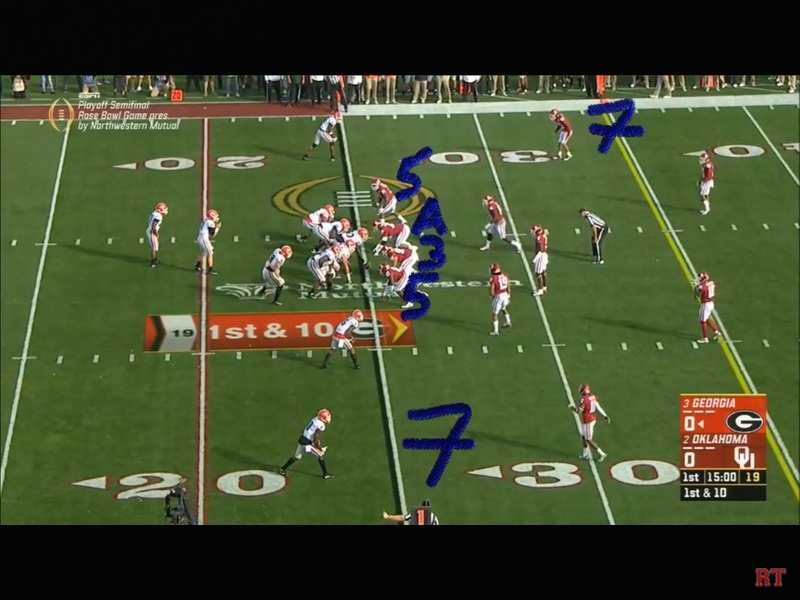 I’ve said all year long and last year that this offense is best with play action mixed in. 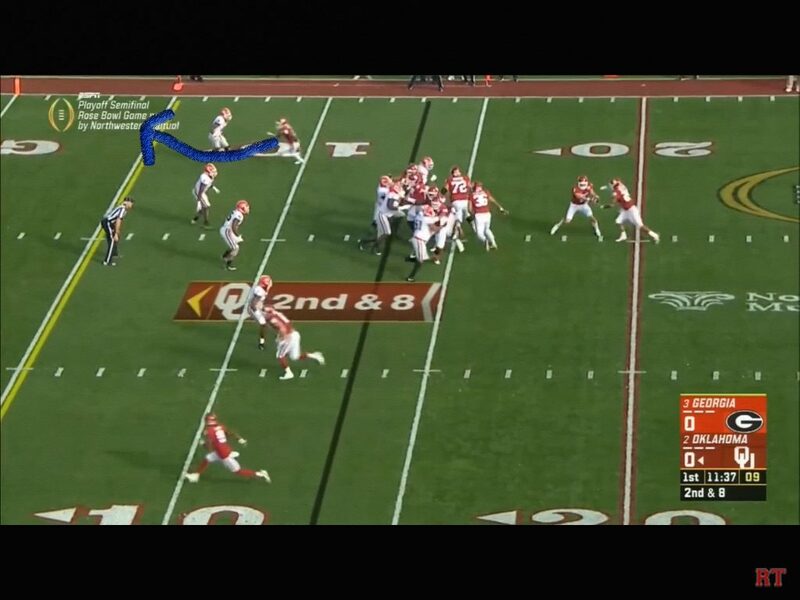 EVERYBODY is looking into the backfield, and with man coverage to the bottom, I was hoping the Sooners would run this a bit later and then raise up and toss it out to Hollywood off of the Jet Sweep motion. Coming back on the next play, it’s play action again. Hollywood this time is wide open at the top. The threat of the run game, even if it isn’t effective freezes your linebackers and makes defensive coordinators more hesitant to blitz. 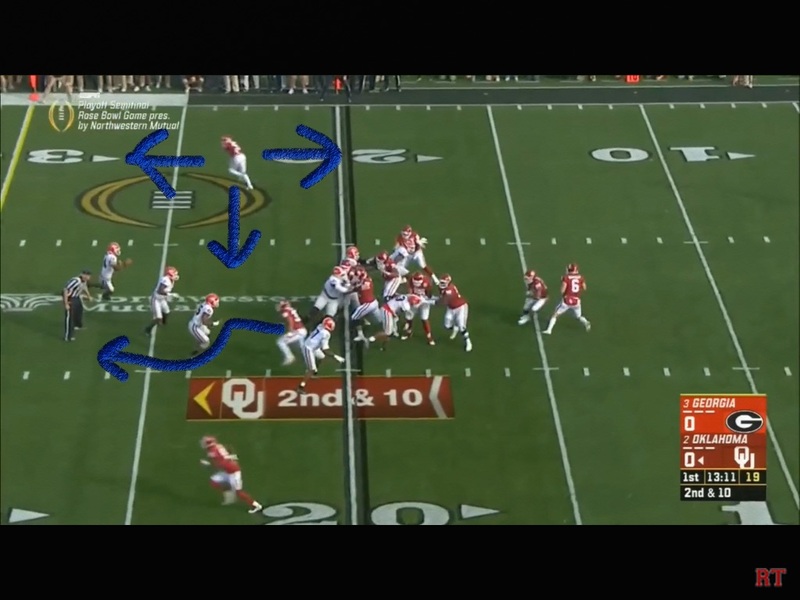 I felt like that the Sooners got away from this in the 3rd quarter and went to more of a traditional drop back look…but we’ll get to that. And as the fake cleared to Rodney, the linebackers went with him, being conscious of the swing pass as well. That created a bunch of space for Flowers after the catch for the run. 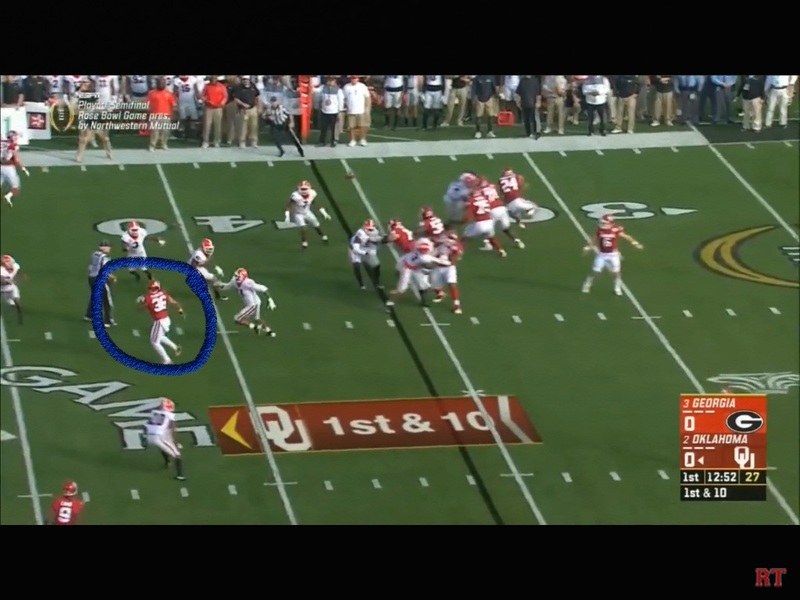 Moving the pocket a bit for Baker was a nice wrinkle too. When flowers caught this and when a few more yards I was thinking that Riley was going to play action Georgia to death if they could get the run game going. 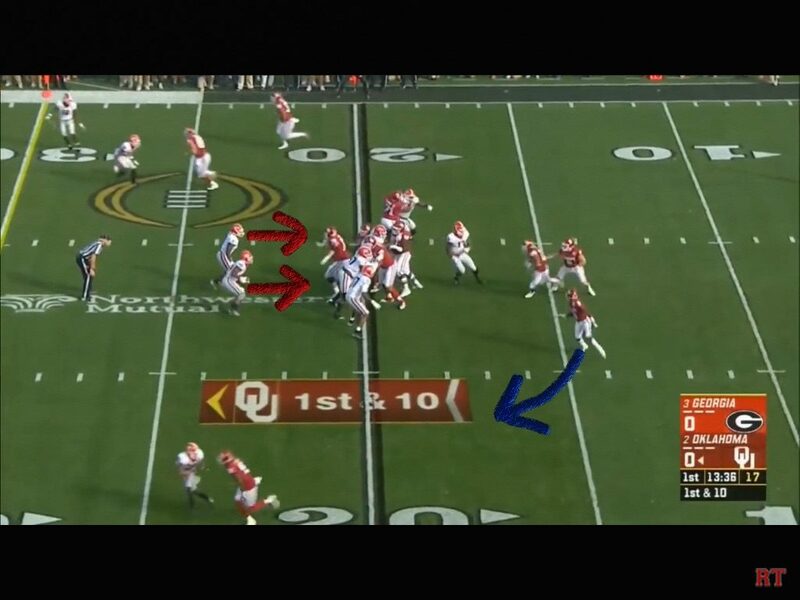 Baker came right back and off of another play action look, he had Hollywood on the swing pass fake or Flowers down the seam. 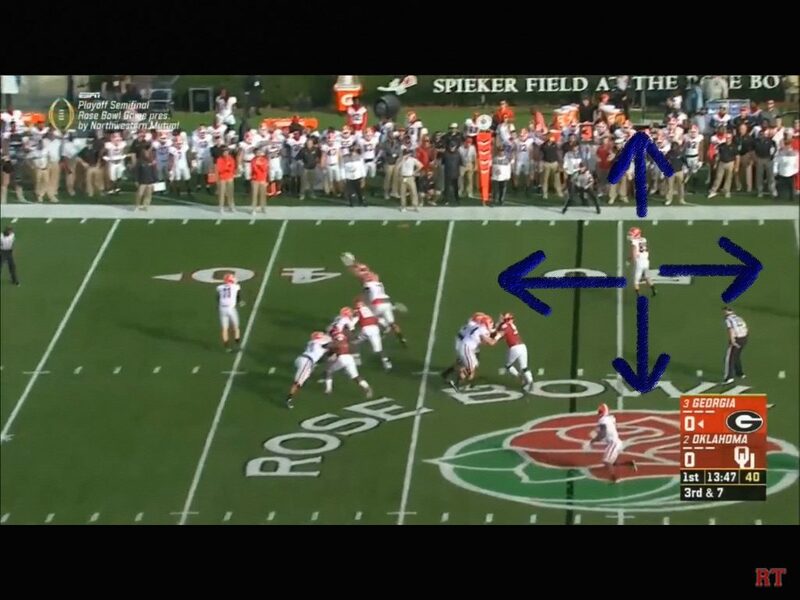 And he dropped it “down the silo” to Flowers in between four defenders. This is a play not many qb’s can make. Flowers caught this and rumbled down to the 35 for Georgia. This one’s just me spitballin, but it was a swing pass to Anderson. I would have loved to see a lead option to the right. You’re outnumbering them for days, and if you pull big Powers around, then you’ve got a plus two advantage with Baker and Rodney out on the edge. Not sure who you option off of because everyone’s accounted for. And again you guessed it! Play action. Georgia’s head was swimming at this point, and it was very simple stuff the Sooeners were doing, but it was what they did all year.